An ancient Indian temple - built where the Buddha is said to have found enlightenment - is celebrating its United Nations heritage site status. A formal ceremony at the Mahabodhi temple in Bihar state attracted tourism officials, foreign dignitaries and hundreds of chanting Buddhist monks. Officials hope the temple, Buddhism's holiest shrine, will now become a major draw for tourists and pilgrims. But security fears still deter visitors to Bihar - India's most lawless state. The United Nations' heritage body, Unesco, declared the Mahabodhi temple a World Heritage site in 2002, but the site was formally dedicated on Thursday. 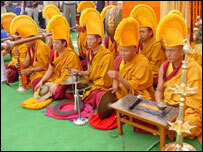 Lamps were lit, drums were beaten and Buddhists monks chanted special prayers. The Buddha is said to have attained enlightenment 2,500 years ago, as he meditated under a tree which stood at the site of the present complex. The temple itself is said to be at least 1,500 years old. Officials said they hoped the new funds and attention directed towards the site will bring it a status akin to that which the Vatican and Mecca enjoy amongst Christians and Muslims. A site administrator, Brajesh Mehrotra, said the state government of Bihar has already spent $65 million to renovate the temple and spruce up the town of Bodhgaya where it lies. Unesco is also expected to spend money on the site's upkeep. A brief row erupted at Thursday's ceremony when some Buddhist monks walked out in protest at having been seated on the floor, while other foreign guests were given chairs. Buddhist tradition demands that monks be seated above other people, they complained. Some guests at the ceremony were sceptical about the Indian government's plans to attract more visitors to the site. Robberies and kidnappings are commonplace on Bihar's roads and religious pilgrims are often targeted.